The cheerful spirit, as well as the need for joy, color and music of the Fassa people, brought about the formation of several groups in the 1920’s. They were free from local obligations and statutes, dressed in traditional costumes, and had a flag-bearer carrying a banner of 7 colors. It was a flag that at one time had 5 colors, namely those established by the Fassa community, then followed by a flag with 7 colors that represented each of the 7 respective Fassa municipalities. Despite this desire to come together in groups, the poverty and hardships of the time did not allow for the proper foundation of a folklore group. 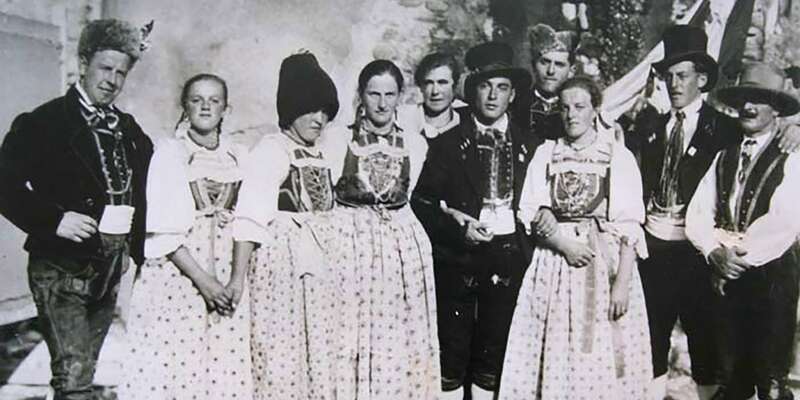 Still, the traditions and the beautiful Ladin costumes, which very few people possessed, didn’t seem in danger of extinction because they lived on in the hearts of all the Fassa people. Still, WWII and the hard times that followed destroyed (or at least seemed to) that cultural wealth of rituals and various traditions, music, and dances that survived The Great War (WWI). The inhabitants of Fassa Valley, tested by the suffering of war, felt a need to stand strong, to maintain their traditions, and to remain faithful to their joyful and cheerful spirit – it is they who formed the first small folklore group in the beautiful village of Gries, near Canazei. This small group consisted of people from Canazei and Gries. Their costumes were owned by the members themselves or borrowed from a “Fassano” who had been able to keep them intact over the centuries. Officially, this group was created in the early ‘50s and led by “Tita Piasech” of Gries. But from photos found in some Fassa houses, it’s likely that these people formed a group even before the war. The members at the time were (see photo above): Gigio da Molin, Luigia Piasega, Maria de Ciciòl, Giovanino da Poza, Rosa de Cercenà, Mondo de Zerilo, Cornelio del Lip, Angela del Grisc, Gigio del Grisc, and Tita Piasech. Over the years, this small group continued to expand. At a certain point, Don Mazzel, president of the “Union of Ladins of Fascia and Moena” thought about regularizing the group’s foundation, perhaps through the creation of a statute and a cash register. As president of the Union of Ladins, he thought it was a good idea to legalize it all! 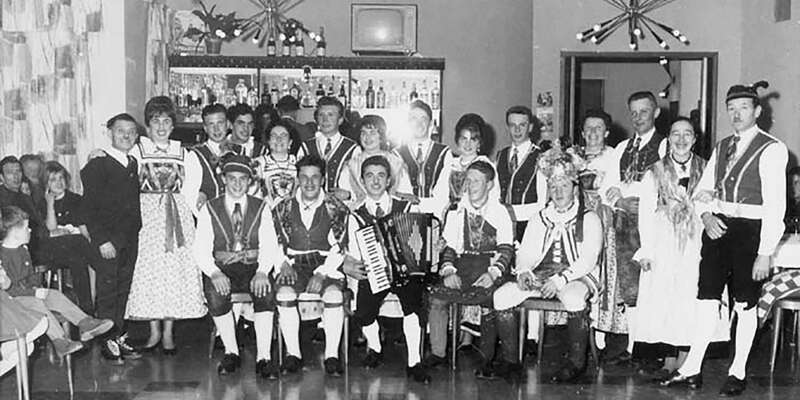 In the early ‘60s, also the people of Alba and Penìa, who for years were accustomed to wear their beautiful costumes to parties and ceremonies and who used to organize masquerades and dances with Ladin music, pondered the idea of establishing a folklore group in order to preserve that which could be lost due to future progress. On 27 September 1962, Mr. Giuseppe Iori (Bepin de Mita), upon the advice of don Mazzel and prompted by the tourist promotion agency, sent a letter and accompanying check for 9,500 Lire to the Department of Arts & Entertainment of ENAL (National Agency for Workers’ Assistance), requesting that the group be registered with the aforementioned institution. ENAL would be responsible for informing the group leader where and when events and folkloristic gatherings would be held in Italy and communicate the group’s participation. The Group members at the time of its foundation were: Iori Giuseppe (group leader), Iori Cesare, Iori Evelina, Valeruz Antonietta (vice-leader), Soraruf Francesco, Soraruf Giuliana, Dantone Maria Teresa, Dellantonio Mario, Cavulli Roberto, Soraperra Maddalena, Dantone Lorenzo, Dantone Agnese, Iori Guido, Valeruz Eligio, Salvador Giulia, Iori Riccardo, Lorenz Stefania, and Dantone Maria de Paul. 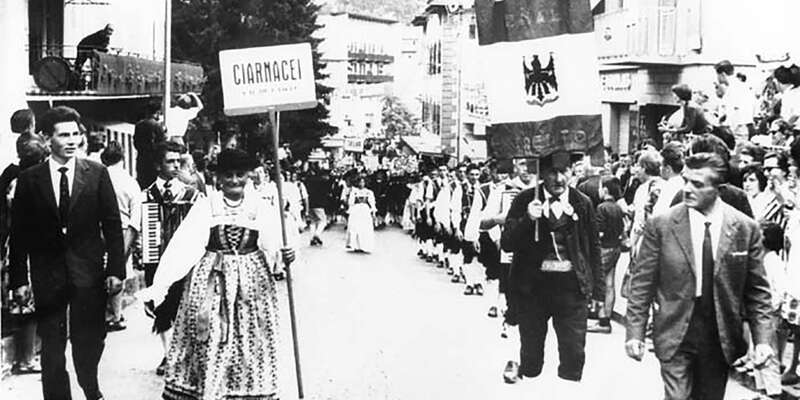 For a few years after 1962, two folklore groups co-existed side by side: that of Alba-Penìa, called “Marmolèda”, and that of Canazei-Gries. A year after the foundation, Bepin de Mita put in a request for contributions. According to one document, the group lacked at least 4 male and 4 female costumes. And as the group consisted of 25-28 members, it also needed a national banner, which was a must at folklore events. The Canazei group also owned some costumes. Don Mazzel had collected all the costumes that were made available to him from a number of Fassa homes and had them mended. Carlo Zulian, known as “Carleto sartor”, was a professional tailor who was originally from Soraga and married in Canazei. He had the important responsibility of taking care of the costumes. At the time (1962), Carleto was also the group leader in Canazei. Don Mazzel wanted a group leader for each town. This would not limit the members to dance in just one group as it would still allow them to dance with the group of a neighboring town. 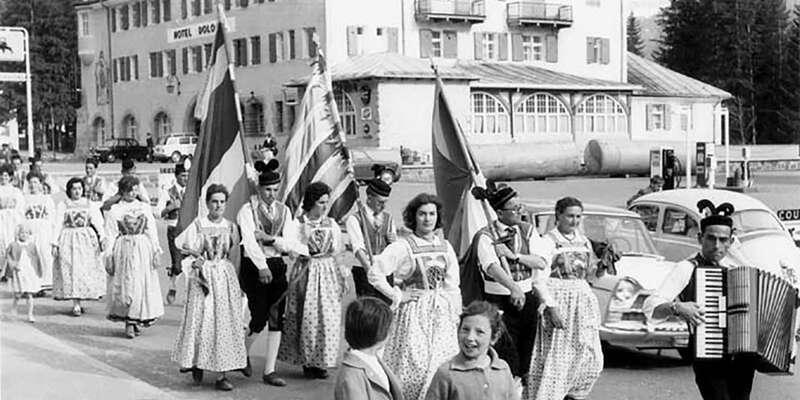 From the ‘60s, the Ladin Congress in Bolzano is worthy of mention because at the time, the ENAL of Bolzano sent an invitation not only to the 2 group leaders, but also to the Campitello group leader, Cipriano Bernard. Cipriano was an enthusiastic dancer who later joined the group of Alba and Canazei to teach those dances and movements he was well known for. When the organizing committees also allowed the participation of a group wearing masks that refrained from much dancing to become part of the larger group, it exemplified specific traditions related to Carnival, the only time of the year during which one was allowed to dance and have fun. 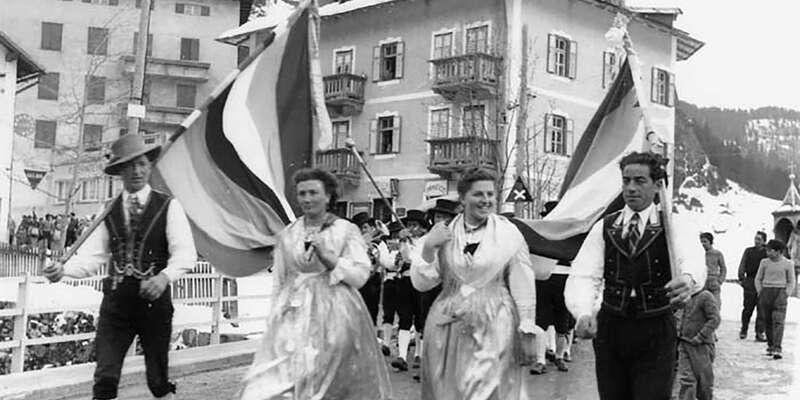 Other events that deserve to be remembered are those of Dro, in Trentino and that of Zofingen in Switzerland, of which articles and accompanying photos of “Fassans” were published in local newspapers. The relationship between the group leaders of the 2 groups became increasingly tense, but there was a tendency to put aside any “misunderstandings” for the greater good of the groups and their love of traditions. In no event should those have to suffer because of personal issues. In time, Amadio Micheluzzi took over the direction of the Canazei group. On 30 August 1965, everyone came together for the benefit of cultural preservation. Spurred on by the Ladin Union of Fascia and Moena, the group leaders of the individual dance groups sought to prepare an official merger contract in the presence of the director of the Trento ENAL, Mr. Barletta. Unfortunately the group leaders of Canazei and Gries disagreed and didn’t look favorably upon an eventual merger. Therefore, they did not sign the contract. Despite all of this, Bepin de Mita was increasingly convinced that a merger would resolve the organizational problems and would perhaps also help to heal old “wounds” and reestablish some contact between the group members. Unfortunately, his dreams didn’t materialize. 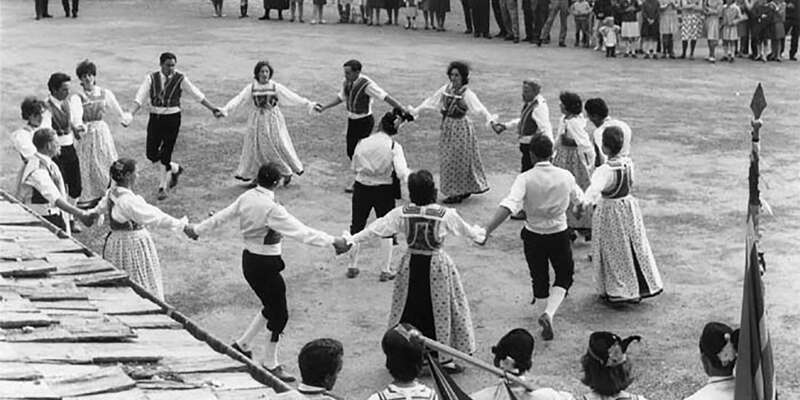 In subsequent years, the Canazei group was disbanded and the most eager dancers often joined the Alba group to participate in folk festivals. After the sudden death of Bepin, Giacinto Micheluzzi took charge of the situation and led the group in the years that followed. In the early ’70s, Giacinto Micheluzzi passed away and Guido Iori de Berghin took over the reins of the group and determined their direction. It was Guido who strongly urged the former members of the Canazei group to come dance in Alba. From ’74 onwards, while still under the guidance of Guido Iori, the two groups followed the same path and finally attained the much desired “fusion” — the folklore group Dèlba, Penìa, Cianacei and Gries was officially established. From the time of this official merger, the folklore group has never been divided or dismembered in such a way as to compromise its existence. As of 1990, Stefano Bernard led and coordinated the 40 members with a subtle “savoir faire”, typical of a born politician. Stefano was clearly capable of pleasing everyone and good at avoiding disagreements. For the past ten years, dance rehearsals at the Penìa headquarters have been a sure thing! In recent years the group has livened up and animated village festivals, religious and tourist festivities with their presence. 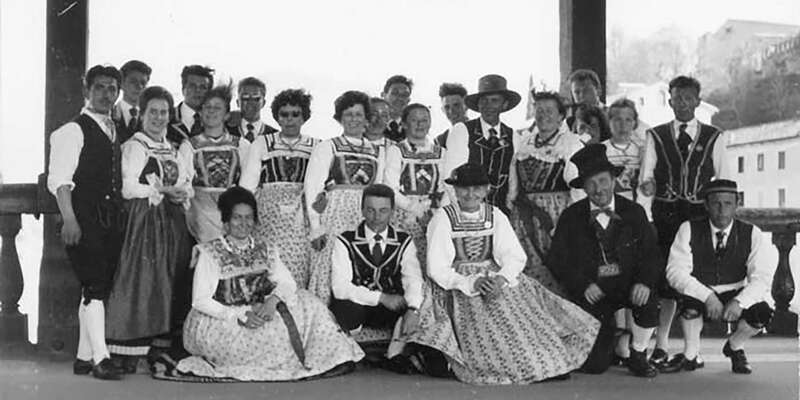 They attended dances and international folklore meetings such as “Kursaal” in Merano and in Jenbach, Austria. 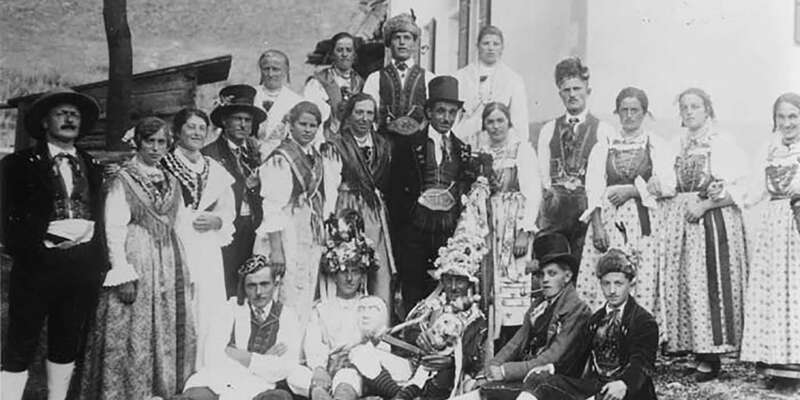 They also participated in the international festival of folklore groups and bands in Salzburg, where they always received mention in the local newspapers. In 2000, as part of its need to set new goals and gain international exposure, the group attended an international meeting in Prague. In collaboration with the Cultural Institute “Ladino di Fassa” and the Hopkins University of Baltimore (USA), the group took part in a tour that made visits to the cities of Washington and New York in 2002. In addition to various regional events, the group also participated in an international folkloristic gathering in 2003, in Porto Allegre, Brazil, together with representatives from 23 other nations. The group changed its name in 2004, simplifying it to “Gruppo Folcloristico Canazei” (Canazei Folklore Group), whilst still representing all 4 areas of the Municipality. Since 2013, the group’s president has been Ingrid Iori, who enthusiastically coordinates dancers and musicians. There is certainly no shortage of contacts with other Ladin groups: Gardena, Badia, Fodom and Ampezzo. With these groups, we can measure our progress, learn new dance moves, enlist different opinions, and grow closer to the Ladin culture.